Photo Courtesy of Brian Meyers, Landcore Engineering Consultants | A rendering shows the proposed Crossroads X warehouse project with changes made by the developer. The Greenwich Township Planning Commission on Monday tabled action on the revised preliminary plan. The Greenwich Township Planning Commission postponed a decision on the Crossroads X warehouse at its meeting Monday in the township building.On the advice of its solicitor, Daniel Becker, the commission tabled action on a revised preliminary plan until it meets on Sept. 18 at 7:30 p.m. in the township building. After reviewing the plan, the planning commission makes a nonbinding recommendation to the township supervisors, who have the final say on the project. The target date of a decision by the supervisors is Oct. 2. 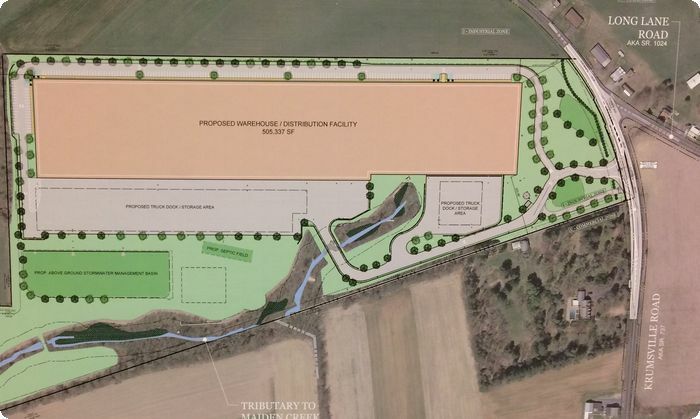 James A. Vozar, owner of JVI company of Wind Gap, Northampton County, proposes to construct a 505,000-square-foot warehouse along Route 737, north of the Krumsville interchange on Interstate 78. To comply with requests by PennDOT and the township supervisors, JVI submitted a revised project plan to the planning commission. Brian Meyers, project manager for Landcore Engineering Consultants of Philadelphia, outlined the changes to the five-member commission. Under the updated plan, the entrance to the site was redesigned and moved to the south of its location in the original plan, at the request of PennDOT. The original design called for Long Lane Road’s reconfiguration, which has been eliminated in the updated plan. In addition, at the request of the supervisors, an emergency access road has been incorporated into the design. Chris Noll, township engineer, reported that JVI has basically complied with the township subdivision and land development ordinance and other relevant zoning provisions. JVI requested a wavier from provisions that require studies on the project’s impact on public utilities and recreation facilities. Meyers said the utility study is irrelevant because the warehouse will have on-lot sewerage and its own wells. The only public utility it will use is electric power, which will be provided by Met-Ed. The project will have no impact on recreational facilities, Meyers said. The warehouse, he said, will have 201 parking spaces, nearly double the 102 required by township ordinance. Under questioning from residents, JVI said that the project will have an 100,000-gallon-water tank reserved for fighting fires. The warehouse also will be equipped with a sprinkler system. About 20 residents attended Monday’s meeting. Noll said that studies by PennDOT and the developer’s engineers indicated that the traffic volume did not warrant a signal at Route 737 and Old Route 22. However, Dodie Sable, who lives near the intersection, said the intersection has been the scene of several collisions that left motorists with serious injuries. Sable also raised the question of the impact on household wells during construction of the warehouse. Recent realignment of the Route 737 bridge over I-78 turned well water muddy, she said. “Construction of the warehouse will do more damage to our wells, where the water quality is already bad,” she said. If that happens, Becker said, the developer is liable to provide drinking water to residents. Marc Sable, Dodie’s spouse, questioned traffic volume calculations made by PennDOT and a consultant hired by the developer. When the project was proposed in April, the developer estimated that there would be 320 trucks moving in and out of the warehouse in a 24-hour period. But depending on the tenant that occupies the warehouse, Sable argued, the truck volume on Route 737 could be three or more times higher than the initial estimate. “That’s a mess,” Sable said. The developer declined to identify the tenant or indicate if there currently is a tenant.